The 2017 Federal Budget, which will be published a month from now, will focus on a completely pointless fiscal target and ignore a series of important issues, writes Dr Steven Hail. THERE IS NOW less than a month to the Commonwealth Government’s fiscal statement, which is generally but misleadingly referred to as "the Budget". The priorities which ought to be addressed in the fiscal statement are unemployment and underemployment (and especially youth unemployment and underemployment); inequality; household indebtedness and financial fragility; the related issue of housing affordability; and climate change. At the same time, the Turnbull Government should be exploring fundamental changes to the financing of Government investment and outgoings; the regulation and supervision of commercial banks and other parts of our finance sector; the balance between fiscal policy and monetary policy in the management of total spending, and to the frame it uses to interpret macroeconomic data; and to determine its macroeconomic policy generally. Australia’s official labour force underutilisation rate – which includes both the unemployed and the under-employed but excludes those marginally attached to the labour force – currently sits at about 14.5%, with the female under-utilisation rate higher than this at almost 17%. For those aged 15-24, the under-utilisation rate is at a record level — higher than it was during the global financial crisis, or during the recession of the early 1990s. The trend statistic was 31.5% in February. Youth unemployment in Australia is clearly at crisis levels and it seems nobody has even noticed. People are too worried about corporate income tax. Who cares about the young? The fiscal statement should include a meaningful commitment to full employment — and that means a federally funded but locally managed job guarantee programme. The money should go to those regions and those groups where it is needed and the money should come from the Commonwealth. Australia’s income and wealth inequality, though low by U.S. standards, is now much higher than it was a generation or two ago. By the 1970s, it seemed that in an advanced modern democracy it was unthinkable that inequality would be allowed to return to levels seen earlier that century, with a long run trend for wages to make up a lower and lower share of national income, and wage rates falling further and further behind productivity gains. Yet those things are what has happened. Relative poverty, inequality and the share of profits in national income have all risen, as mismanaged globalisation, accelerating financialisation, diminishing trade union power and a shift of emphasis away from fairness and towards keeping labour as cheap as possible has come to be taken for granted. This has all happened in an economy which has, in some ways, been deregulated, but in other ways rigged in the interests of the top few per cent of the income distribution. One of the ways to begin to fight back against an unsustainable trend towards growing inequality is to restore full employment with an adequately paid job guarantee, including good working conditions. Another is to restore a higher degree of profession to the tax system. I am not discussing corporate taxation here, which is relatively easy for multinationals to avoid, I mean personal taxation. The elimination of the under-taxation of capital gains and of the rort of negative gearing of property investments would be a help, but more important here is an increase in the marginal rates of income taxation paid by those on taxable incomes which are far above the median. If some of these people move off-shore, we'll do without them. It isn’t as though their taxes "pay" for anything, as I will explain below. However, we do need as a nation to levy taxes and from the perspective of social equity; it is right that the tax system be redesigned to enhance a campaign for greater equality of outcomes. There is also a case to be made for the ending of compulsory tax-advantaged superannuation and the restoration of an equitable aged pension, but I have written about that quite recently, so I will not go over the arguments again here, except to say that it is another way to combat inequality, this time in old-age. As for housing affordability, you can expect to see the Government opt for a half-hearted and semi-privatised social housing model, which will then be under-funded in any case but potentially, at last, be better than doing nothing to promote affordable housing. 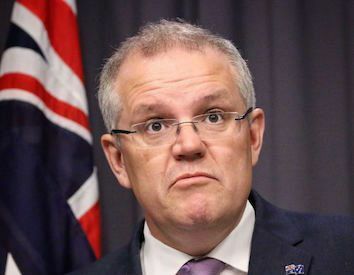 However, it seems unlikely they will tackle negative gearing and capital gains tax, and more than likely they will continue to claim that these tax breaks to investors somehow help the cause of housing affordability — when in fact they do the opposite. They will also ignore the growing evidence of a property bubble in Sydney and Melbourne and instead lay emphasis on the need to relax planning regulations to increase supply, in what they will wrongly argue to be an efficient property market. The first thing they ought to be doing is to restore large-scale direct public investment in housing for rent, wherever possible in areas where people want and need to live. Once again, this should be Federally funded and locally managed. The second thing that needs addressing is the dangerously high – almost world record level – of household debt in Australia, since this is the elephant in the room, where financial stability and prosperity are concerned in future years. In the immediate future, guaranteed full employment is of vital importance, as any significant increase in unemployment could prick the property bubble with very serious consequences for many thousands of households and for the banks. Looking further ahead, Australian banks and other financial institutions need to be re-regulated. The major banks are virtually part of the public service in that they are "too big to fail" and so virtually guaranteed by the government against going bust. On that basis, they should be more closely controlled in terms of the assets they are allowed to invest in and the activities they are permitted to undertake. There should be a greater emphasis on lending to small and medium-sized businesses, and there should be much greater controls and limitations placed on mortgage lending — and on the way in which credit is marketed to households. Australia should abandon its addiction to household debt. The "cash rate" should no longer be seen as the accelerator and the break on total spending in a deregulated financial system. Households should be encouraged and enabled to spend more out of wage incomes and less out of debt. It should be made easier to find paid employment but harder to take on debts you may be unable to repay. Given tightly regulated banks, there is no reason why the cash rate could not be kept stable at a low level, or even at 0%. Given a floating exchange rate and an economy which adjusts well to fluctuations in that exchange rate, there is no compelling reason to raise and lower interest rates over time to manage the foreign exchange market. Given a well-regulated banking system and the appropriate use of fiscal policy by our monetarily sovereign government, there is no need to raise and lower interest rates to manage total spending in the economy, either. That role is better assigned to fiscal policy. And what should our approach to fiscal policy be? The first thing to admit is that the fiscal balance in the future will normally be in deficit in Australia, as in most other countries. The Turnbull Government’s "Budget", unlike a household’s budget, does not need to be balanced on average over time. This is why the word "budget" is probably best avoided where the Australian Government is concerned. It is impossible for the Australian Government to run out of Australian dollars. It is, on the other hand, possible to run out of things to buy with those dollars, or to spend too much and to cause inflation by doing so. This is the macroeconomic reason for imposing taxes — not to "pay for" things, but to allow the Government to invest and to spend without creating inflation. This does not mean taxes have to equal government spending, however. Government expenditure will normally exceed the tax take and it should be allowed to do so by however much is necessary to deliver non-inflationary full employment. The precise fiscal balance should be determined by whatever is the current scale of the job guarantee scheme. Any inflation driven by excess spending would lead to higher taxes to slow down total spending and consequently the movement of some workers from private employment into the job guarantee — at least until inflation was back under control and the private sector growing again. There is far more to say, much of which I have written about before. If you are concerned about the growing supply of government debt securities implied by a persistent fiscal deficit, then you might like the idea of scrapping those securities entirely and replacing them with the offer of term deposits at the Reserve Bank of Australia, which would then be regarded as monetary instruments rather than government debt, but perform essentially the same function as government debt. And, of course, I have omitted two vital long-term issues. One is the problem of provisioning for an ageing population in the years ahead. The best way to do this is to invest more heavily now in those resources and skills we know we will need in the future to meet this challenge. In the future, it is true that higher taxes might be needed if spending exceeds the productive capacity of these resources and skills. But we don’t need higher taxes now for this purpose and, indeed, they would do nothing to help us to meet this future challenge unless they provided room for those investments I referred to above. The biggest long-term problem of all is the issue of climate change. The answer is essentially the same. We need a government which is prepared to invest far more heavily today in the technology and resources we will need in the future to transition rapidly to a low emission economy and to a world where inevitable climate change has created a set of problems that cannot be avoided but can be partially mitigated. Part of this, in my view, should be a government owned and operated system for generating and distributing electricity, but that is an entirely different story. You can read more by Dr Steven Hail at erablogdotcom, follow him on Twitter @StevenHailAus, as well as on Facebook at Green Modern Monetary Theory and Practice.